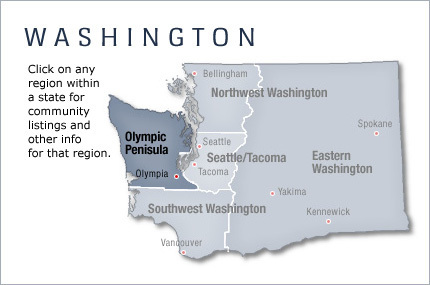 The Olympic Peninsula is the large arm of land in western Washington state that lies across Puget Sound from Seattle. It is bounded on the west by the Pacific Ocean, the north by the Strait of Juan de Fuca, and the east by Puget Sound and the Hood Canal. Cape Alava, the westernmost point in the contiguous United States, is on the peninsula. The peninsula is home to Port Angeles, Port Townsend, Olympic National Park, and the Olympic Mountains. Of the handful of temperate rain forests in the world, the Olympic Peninsula is home to the Hoh, Queets, and Quinault rain forests.